Here are some pictures of the Belgian C++ Users Group meeting held on 28th of February 2018. The next meeting of the Belgian C++ Users Group is planned for Wednesday February 28th, 2018 at 18:00 at Nokia. For travel tips, see how to reach Nokia. Nokia ( http://nokia.be/ ) is sponsoring this event by providing the location, drinks and catering. Boost.Asio is a cross-platform C++ library for network and low-level I/O programming, either using a synchronous or asynchronous model. We will examine this powerful library in 2 sessions. In this second session we will pick up where we left of, after connecting as a client we will start interacting with the server, and we will see how to implement a server application. We will do this both in a synchronous and an asynchronous way, keeping an eye on scalability. Note that the C++ Standard networking proposals are based directly on Boost.Asio, so next to learning this great library we are also preparing for the future C++ standard. Through the much-hyped advent of Industry 4.0 and IoT, billions of new bare metal devices will be connected to the internet or intranets and will be expected to talk to each other, even across company boundaries. This presents a plethora of new challenges, many of which share a common root; it is crucial that we build a foundation for code reuse and encapsulation of expertise in this domain. What does cross-platform code really mean when we are targeting thousands of ‘platforms’? When encapsulating expertise, we implicitly make assumptions about user code and user code implicitly makes assumptions about library code. What are valid assumptions? What is the basic interface? In this talk I will present a possible future for bare metal development which attempts to answer these questions. 20:45: Introduction to Nokia, followed by a drink. We will be giving away a copy of C++ Standard Library Quick Reference. We will also be giving away 2 JetBrains coupons for 100% discount of a 1 year free personal subscription for any single JetBrains tool/IDE JetBrains. The event is free for everyone, but you need to register for it. There are 60 seats available for this event. Note: The deadline for registrations is February 25th, 2018! For GPS, enter destination “Van Immerseelstraat” and not the “Copernicuslaan”. Take exit 3 (Borgerhout / Antwerp) on the Ring of Antwerp (R1) and turn left towards the city center. Cross the Singel (R10) and follow Plantin en Moretuslei under the railway bridge towards the city center. Just before the next railway bridge, turn right into Van Immerseelstraat where you will find the entrance to the underground parking. Take exit 17 (Antwerpen Centrum / Borgerhout / Singel) and turn left for the railway bridge to the Noordersingel (R10). At the second crossroads turn right under the railway bridge to Plantin and Moretuslei towards the city center. Just before the next railway bridge, turn right into Van Immerseelstraat where you will find the entrance to the underground car park. There is a public parking facility underneath the building, but it is not free (http://www.interparking.be/en/find-parking/Centraal/). Traffic in Antwerp is not the easiest, so it’s recommended to come by train if possible. The Nokia building is less than 5 minutes walking from the Antwerpen Centraal train station. From the south, take the Antwerp Ringfietspad (cyclepath), and ride via the station of Berchem and the Mercatorstraat (along the railway berm) towards the station ‘Antwerpen-Centraal’. From the north, ride via the Noorderlaan and the Italiëlei. At the Franklin Rooseveltplaats, turn left towards the ‘Antwerpen-Centraal’ station. From the Linkeroever, ride via the Sint-Anna tunnel and the de Meir. Via the Keyserlei you will arrive at the ‘Antwerpen-Centraal’ station. Via the Lange Kievitstraat (bicycle crossing under the station) you will arrive at the Kievitplein. Visitors can park their bicycle safely in the underground bicycle parking to the right of the station entrance. Trams 2, 6, 9 and 15 have a stop at the premetro station ‘Diamant’ at the ‘Antwerpen-Centraal’ train station and at the ‘Plantin’ premetro station at the Plantin and Moretuslei. Thank you everyone for joining the Belgian C++ Users Group meeting on 9th of January 2018 and thanks to Barco for sponsoring the event by providing the location and catering. This was the biggest BeCPP event ever. Here are some pictures of the Belgian C++ Users Group meeting held on 9th of January 2018. Due to its success, the number of attendees has been increased to 110 for the Belgian C++ Users Group Meeting planned for January 9th, 2018. Get all the details of the event here. 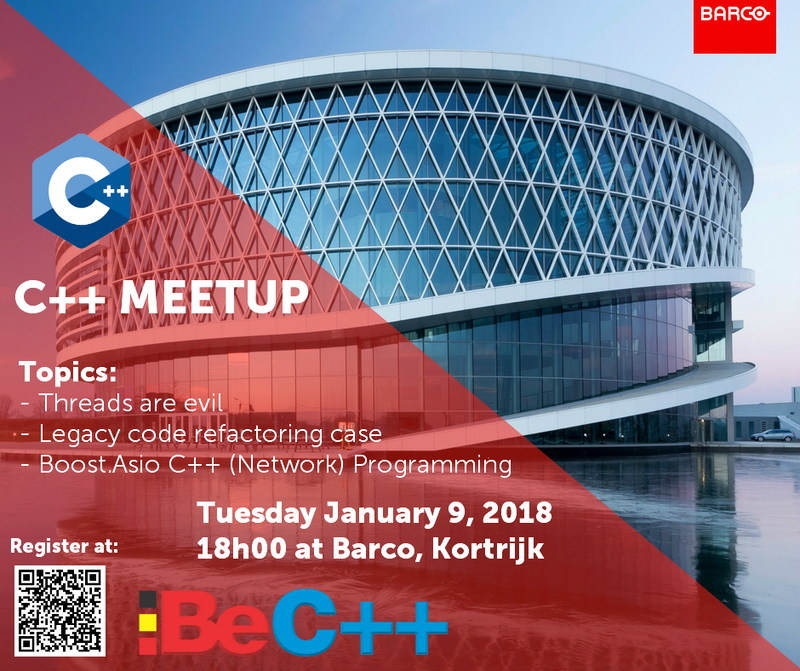 Barco has created a nice flyer for the Belgian C++ Users Group event of January 9th 2018. The next meeting of the Belgian C++ Users Group is planned for Tuesday January 9th, 2018 at 18:00 at Barco. Barco ( https://www.barco.com/ ) is sponsoring this event by providing the location, drinks and catering. Many applications beyond the scope of “Hello World” use threads for various reasons. Be it for having many sequential execution paths, preventing a blocked UI or offloading CPU intensive tasks to the background. However threads don’t come for free. They suddenly add a complex dimension to a simple application. Who dares to claim to have written a flawless threaded application? Is it really bringing a performance boost? Let’s have a closer look to what we are facing when using threads and what alternatives we have. Going from legacy C++ code to state of the art tested and testable code by means of focused refactoring and componentization. Building a future proof platform using code generation. Boost.Asio is a cross-platform C++ library for network and low-level I/O programming, either using a synchronous or asynchronous model. We will examine this powerful library in 2 sessions. The first session will first focus on using it as a task processor, something to offload work to, in a nice scaling way with respect to threads. Next we will have a look at timers based upon this library. Equipped with the basic techniques we will start looking at the networking part, first examining some structures and some first network activities, and if time permits it we will implement a first network client. From this talk on boos:asio:ioservice is ready to service you! In the second session we will dive head first in the network programming with no further limits. 20:45: Experience tour by Barco (Laserprojection/extreme surround sound in new cinema format, operation room for healthcare, control room, entertainment/concerts…), followed by a drink. We will be giving away 3 JetBrains coupons for 100% discount of a 1 year free personal subscription for any single JetBrains tool/IDE JetBrains. There are 100 seats available for this event. Note: The deadline for registrations is January 5th, 2018! Thank you everyone for joining the Belgian C++ Users Group meeting on 11th of April 2017 and thanks to SoftKinetic for sponsoring the event by providing the location and catering. Here are some pictures of the Belgian C++ Users Group meeting held on 11th of April 2017. The next meeting of the Belgian C++ Users Group is planned for Tuesday April 11th, 2017 at 18:00 at VUB. SoftKinetic ( https://www.softkinetic.com/ ) is sponsoring this event by providing the location, drinks and catering. The journey will start with a test drive of simple method overloading, shortly later enriched with some ‘templates’ laps. Then we shift gears and we add type traits to the mix. In order to arrive at the finish line, some SFINAE herbs are added to spice up the mix. And as the proof of the pudding is in the eating, a small use case, which will bring things together, will be served. In the end the main question remaining is: do we std::enable_if some drinks afterward? 20:45: Short presentation and demo by SoftKinetic followed by a drink. There are 50 seats available for this event. Note: The deadline for registrations is April 4th, 2017!